THE SEPTEMBER 2017 ISSUE IS OUT NOW! Back in the previous decade (yes, we've been around that long), Compass Magazine ran a series of cover stories that focused on all the foreigners who were running restaurants and bars in Taichung. Their diversity of backgrounds and specialties was impressive, and still is, helping hugely to make this a more international city. Credit for inspiring this month's article goes to two more recent members of this group, the French/American partners behind Terroir Wine Bar and Bottle Shop, Leo and Casey. A few months ago--over a glass of wine, of course--they noted a number of Taichung-based foreigners who were actually making their own top-grade food products...chocolate, cheese, meats and so on...for sale to restaurants, hotels and individuals, more often via online sales versus an actual storefront. Impressed by what I heard, I decided this was a fresh international facet to Taichung that we needed to introduce to you. This month's "Made in Taichung" cover article, written by Taylor Melton with a bit of help from me, introduces a good number of these individuals, starting with old friend and Finga's "Kiwi" owner Dereke Bruce, who truly was the pioneer among foreigners opening restaurants and making their own food products, like the excellent breads that he sells to many businesses and individual customers like me. Others featured are newer acquaintances, like American Henry Gerard, who runs a full cheese-making operation with his Taiwanese wife, Brenda. While interviewing him, I enjoyed watching Henry patiently guide a class of eager Taiwanese adult students through a mozzarella-making class, using skills that he has learned from a 70-something Italian master cheese maker. Now that knowledge is being transmitted to local residents across Taiwan. All this represents Taichung's continued evolution into a global city, attractive not only to Taiwanese but also an exotic mix of outsiders who come to stay long-term, expand their horizons, and contribute to their new home in diverse ways. Along those lines, it was with pride--but not much surprise--that I heard the news that Taichung had officially become Taiwan's second-largest city (sorry about that, Kaohsiung folks!) about a month ago, as noted in a "Taichung City This Month" section article in this magazine. 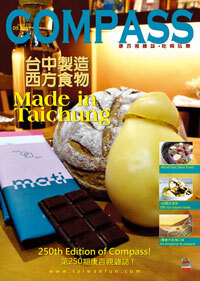 Be sure and sample some of the great "Made in Taichung" products noted in the cover story, either by ordering them directly from the producers or sampling them at restaurants and hotels they supply. With your support, I look forward to seeing this group grow even further. Of course, be sure to read and sample all the other businesses, products and services covered in our many articles and advertisements. On a closing note, many of you have recently inquired about the 2017 Compass Taichung International Food & Music Festival. As the ad this month notes, we are happy to announce that it is scheduled for the final weekend of October, so save those dates. Many more details will follow in the October magazine, but feel free to call or email us (news@taiwanfun.com) if you have questions or want to join as a vendor or sponsor. Have an enjoyable September in Taiwan's Second-Largest City! We provide a free service to the citizens of Central Taiwan. Be a part of this service, and advertise today! Don't feel like leaving your house or live far away? Subscribe today and get it delivered right to your doorstep.